The resolution that came to the Senate floor, approved the U.S. House, would have kept the government open and agreed to Democrats’ demand to reauthorize CHIP, but took no action for DACA recipients. As a result, the Senate voted 50-49 to invoke cloture largely along party-lines, which wasn’t enough to proceed with allowing funds to keep the government open. Both Democrats and Republicans sought to deflect blame for the shutdown immediately after the vote in the Senate came up short. Democrats tagged the move as #TrumpShutdown, while Republicans used the tag #SchumerShutdown. White House Press Secretary Sarah Huckabee Sanders attributed the shutdown to the unwillingness of Senate Democrats to keep the government open in a statement. Trump has said he’s willing to sign legislation that would allow DACA recipients to remain in the United States. As the shutdown approached, Congress had reached a bipartisan agreement that would have kept the government open and provided relief for DREAMers. The White House, however, rejected that agreement on the basis it didn’t provide enough funding for border security. Lorella Praeli, director of immigration policy and campaigns at the American Civil Liberties Union, said in a statement after the shutdown Republicans “chose to reject” bipartisan opportunities on the table. A common theme was budget negotiations were poisoned by Trump’s reported statement at a White House meeting that Haiti and African nations were “shithole countries” and immigrants from there shouldn’t be allowed into the United States. Trump has denied making the comments, but Sen. Richard Durbin (D-Ill.), who was in attendance at the meeting, insists they’re accurate. 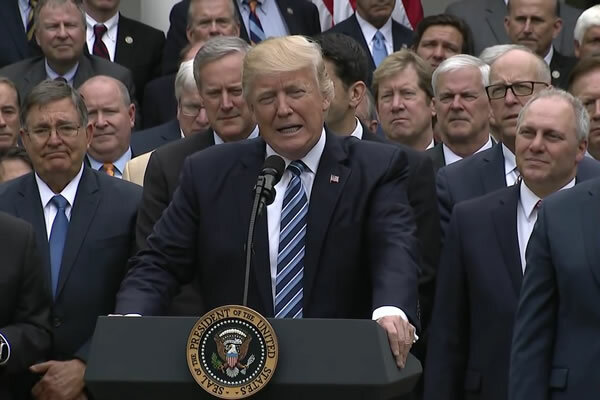 “President Trump and GOP leaders rejected workable solutions to bring the wheels of government to a grinding halt to pursue a cruel, racist agenda,” Hanley said. It remains to be seen when Congress will come to an agreement on funding to reopen the government. In the meantime, federal workers are furloughed and the U.S. government will be compromised in delivering services to the American public. Of course they do. The LBGT are brainwashed morons. It’s just that so many are dating Hispanic men. Trump had already prepared TV commercials which began to air the very first day of the federal shutdown. Trump claims the Dems negotiated in bad faith, but any thinking person can see his creation of the TV commercials clearly proves that he was the one not operating in good faith. Trump is doing Putin’s bidding – dividing Americans, incessantly assaulting the First Amendment, gutting the state department, insulting allies, cozying up to dictators and singing the praises of Putin and Russia. Vote Democratic to restore democracy. Sorry Mark, you have been duped by Don the con, and I realize it is hard for you when you are confronted by the facts. Remember my name because, by 2019, you will realize Trump is a greedy traitor. Not a damn thing in your comment is true and you very well know it. One things for sure it will be generations before this country recovers from Barack Obama if ever. I hear today Obama has retained an attorney! I eagerly await the release of the memo! Poor deluded bigot. You have been so busy attacking LGBT people night and day that you missed reality: President Obama saved our nation from the Great Recession caused by the GOP administration. We have been living under President Obama’s budget all along. Trump was supposed to submit his for the new fiscal year Oct, 1, but he never did his duty. President Obama gets all the credit for the economy, Trump zero. In fact, Trump’s $1.5 trillion tax cut for corporations is mainly going to be used to cut jobs, so your kids and grandkids will get the bills, but not any good jobs. you are so funny! I doubt you even know the so-called great recession was caused by lending institutions being forced by the federal government to issue subprime mortgages to folks without the means to pay them then bundling and selling these worthless loans. Check it out. So, you don’t believe Trump deserves any credit? We agree. Or, are you saying you refuse to give any credit to any President who is black? You are clearly an angry bigot who has yet to try to offer any evidence. I give Obama credit for wasting a trillion dollars on a “stimulus.” I give Obama credit for illegally issuing the DACA EO. I give Obama credit for using the IRS, CIA and FBI to spy on and harass political opponents. I give Obama credit for BLM and ANTIFA. I give Obama credit for allowing Hillary Clinton to get away with failing to protect classified info. Liar – Trump is awesome! Nonsense. Utter nonsense and I mean UTTER. This article proves the LGBTQRSTUVWXYZ mafia has lost it. Is that what they say in Pflugerville? Yep, They are a complete joke. Count – unfortunately that is true. The leadership is a sad joke..